We made it to the finals! 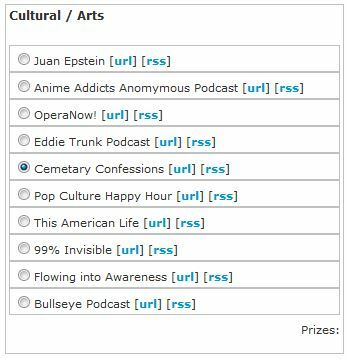 Please go to PodcastAwards.com, select Cemetery Confessions under the Cultural / Arts category, enter your name/e-mail and then submit. You can vote once per day until March 24th. Every vote counts and your support is greatly appreciated!